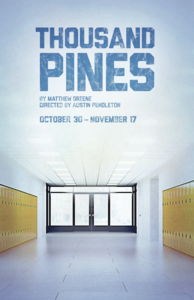 Westport, CT - Connecticut Humanities has awarded a grant of $20,000 to Westport Country Playhouse to support a series of free-of-charge community engagement events surrounding “Thousand Pines,” a world-premiere drama that brings the national dialogue about gun violence to the Playhouse stage, from October 30 through November 17. Written by Matthew Greene, and directed by Austin Pendleton, the play was developed in early 2017 by the Playhouse’s New Works Circle Initiative. The series of community events to examine the work on stage will include symposia, panel discussions, and a talkback with artists involved. In “Thousand Pines,” nothing feels the same since the day Thousand Pines Junior High School was on every news channel and in everyone’s hearts. Six months after a student brought a gun to school and killed his classmates, the families of the children who died struggle with their need for answers and closure. Connecticut Humanities, a non-profit affiliate of the National Endowment for the Humanities, provides opportunities to explore the history, literature and the vibrant culture that make our state, cities and towns attractive places to live and work. Learn more by visiting cthumanities.org. For more Westport Country Playhouse information and to buy tickets, visit www.westportplayhouse.org or call the box office at (203) 227-4177, toll-free at 1-888-927-7529, or visit Westport Country Playhouse, 25 Powers Court, off Route 1, Westport. Stay connected to the Playhouse on Facebook (Westport Country Playhouse), follow on Twitter (@WCPlayhouse), and on YouTube (WestportPlayhouse). The mission of Westport Country Playhouse is to enrich, enlighten, and engage the community through the power of professionally produced theater worth talking about and the welcoming experience of the Playhouse campus. The not-for-profit Playhouse provides this experience in multiple ways by offering: Live theater experiences of the highest quality, under the artistic direction of Mark Lamos; educational and community engagement events to further explore the work on stage; programs for students and teachers with extensive curriculum support material; Script in Hand play readings to deepen relationships with audiences and artists; the renowned Woodward Internship Program during the summer months for aspiring theater professionals; Family Festivities presentations to delight young and old alike and to promote reading through live theater; youth performance training and performance opportunities through Broadway Method Academy, WCP’s resident conservatory; and the beautiful and historic Playhouse campus open for enjoyment and community events year-round.